Are you routinely scruffing, stretching, or struggling with cats, or do you find that you have difficulty with hyperactive, fearful, or aggressive dogs? Learn Low Stress Handling® techniques that apply to even the most difficult patients. 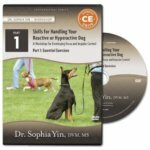 From creating a calm, inviting environment, to using towel wrap techniques, to multiple methods for handling pets of different sizes and temperaments, you’ll learn principles and techniques that will allow you to adjust to the patient’s needs. Put it all together and you’ll create a more Pet-Friendly hospital. Learn how the sights, sounds, smells, and surfaces in your practice may be increasing stress in your patients. Find ways to create a calm, safe, and secure environment. Understand how every interaction — how you approach animals, pick them up, move them from place to place, or restrain them — affects the animal’s perception of you and his willingness to cooperate. 75 min / 2 units. Already have the DVD for this course and want to earn your CEs?